Home/General/Announcing the Inflammatory Breast Cancer Ribbon! 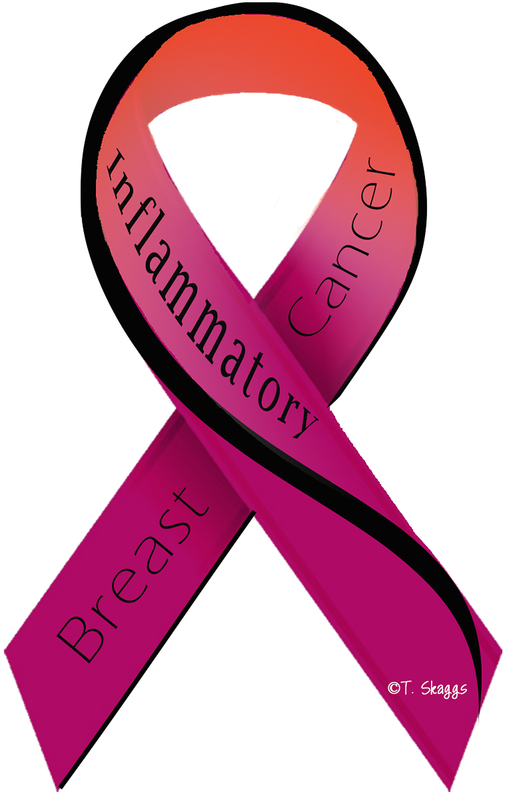 Announcing the Inflammatory Breast Cancer Ribbon! Drum roll please……I know you’re all wishing to know about the IBC #ribbon. The Inflammatory Breast Cancer community has long wished for a ribbon that was unique for this subset of breast cancer. Requests from women and men with IBC, mirroring what has been seen in the stage 4/metastatic cancer groups as they brought more attention to late stage breast cancer, has only fueled the requests from the IBC community for their “own identity.” After off and on conversations over a span of years, the focus narrowed and the time seemed right to have a serious conversation about this. Out of conversations in the largest IBC patient support group on facebook (>600 members), the interest and energy was high and seemed to be the right time to create a ribbon unique to inflammatory breast cancer. An IBC sister, Tess Skaggs, photographer and graphic artist, had offered a series of designs for consideration. She designed 4 options and the support group opened up a poll to see which one was most popular among the broad community of stakeholders both inside of the group and beyond. The poll was left open for 2 months to allow plenty of time for the community to weigh in, and we were pleased to see many votes came in from around the world. The final tally was 401 votes including patients, IBC doctors and researchers as well as family members, and by a large margin, the 4th ribbon (pictured here) was selected as the favorite (57% of the total vote). This ribbon was designed not to replace any charity’s logo, or personal branding but as a gift to the community that can be used in goodwill to give a larger voice to this disease as a unique entity. Why pink, orange and black? The use of pink, as IBC is a form of breast cancer, a well-established color in the cancer world. However, the use of orange/salmon reflects the unique skin presentation of IBC, for example the orange peel appearance, red skin rash, or other changes not usually associated with breast cancer. The use of a thin black stripe reflects that this is an aggressive disease, and encourages us to reflect on the sisters (and men) who fought before us. The ribbon is to be one of hope and solidarity and will be made available for sisters to share as they tell the world about Inflammatory Breast Cancer. Since the most popular of the designs has English text, we have a non text version of this ribbon for international use or other places where the text would not be legible. We are using this ribbon with special permission by the artist who created it, Tess Skaggs.